Below is our latest discussion & it will be updated as conditions warrant. For the most up to date information on a storm, please visit the “Current Storms” section in the app. Major Hurricane Florence: Florence remains a large and dangerous hurricane today. The storm has grown in size as hurricane force winds extend out up to 70 miles from the center and tropical storm force winds reach 175 miles from the center. Hurricane warnings and watches remain in effect for the coastline of the Carolinas. Florence is currently moving northwest around 16 mph and will begin to slow down considerably tonight as it nears the coast of North Carolina. All of the latest computer model guidance is in agreement that Florence will slow down or stall near Wilmington, North Carolina and possibly turn southwest towards the coast of South Carolina. 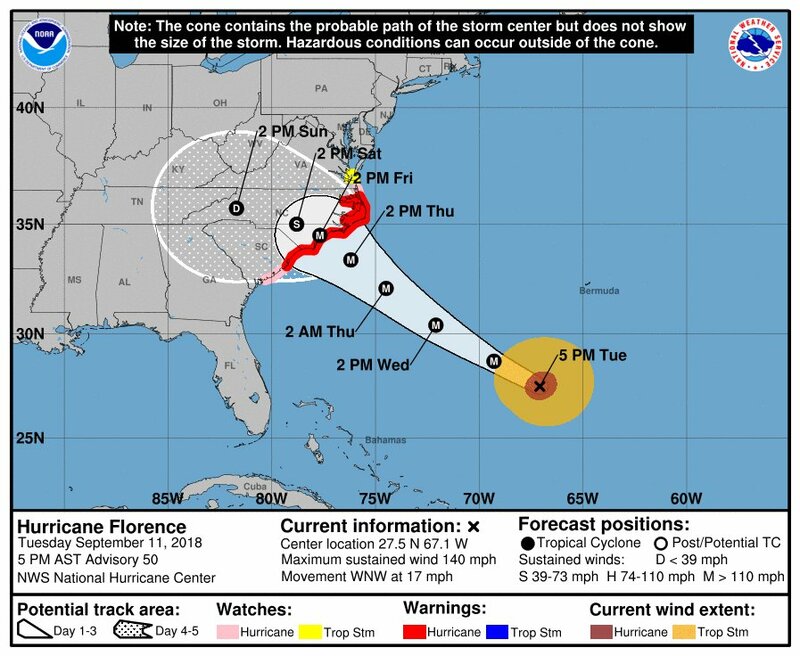 The latest official forecast shows that Florence may not make landfall until Friday morning. 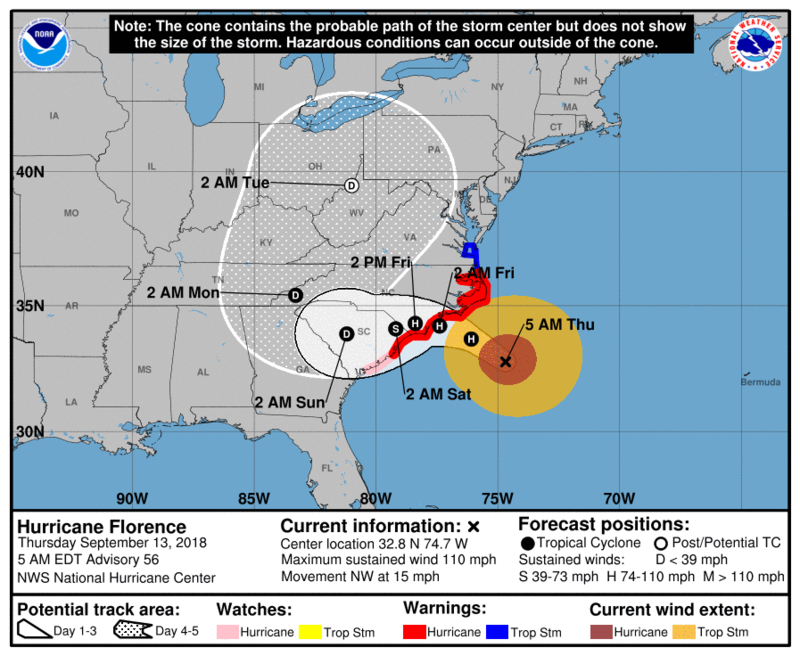 Due to the forecasted slow movement of Florence along the coast, major impacts are expected to occur across portions of the Carolinas. By early next week, Florence will finally begin to move towards North GA & Eastern TN where gusty winds and heavy rain will be an issue. > Prolonged, sustained winds of 74-100 mph+ will be possible around the center. Some locations could experience hurricane force winds for more than 24 hours due to the slow movement of the hurricane. > Storm surge up to 13 feet is forecasted to the right of where the center comes ashore. Storm surge watches & warnings are in effect. > Rainfall amounts of 20 to 30 inches, with isolated amounts up to 40 inches will be possible across coastal portions of North Carolina (see image below). South Carolina, western and northern North Carolina may receive 5 to 10 inches with isolated amounts up to 20 inches. Elsewhere in the Appalachians and Mid-Atlantic states, 3 to 6 inches with isolated amounts of 12 inches are possible. Florence is a very large major hurricane. Hurricane force winds extend out up to 70 miles from the center and tropical storm force winds reach 175 miles from the center. Areas in the purple shading may receive 20-30+ inches. A great visual from our partner, WeatherOptics on which areas will likely have the worst impacts. If you are in or near the cone, please use this time to finish preparations and execute your hurricane plan by early AM Wednesday. Always listen to the advice of your local emergency management officials. Unfortunately, Florence will be a storm that will be remembered for many years to come as it will cause widespread devastation and is a major threat to life and property. It's impossible to cover all the details of this storm in one post, we urge you to review the public advisory from the National Hurricane Center for all the latest and up-to-date information. Please stay safe if the storm is headed your way. Thank you for using the Hurricane Tracker App will have another discussion as conditions warrant. September 10th is historically the peak of hurricane season. It definitely is this year as we have three hurricanes and a disturbance in the Western Caribbean that we are monitoring. We will cover all of these systems in today's discussion, but most of this discussion will be focused on major Hurricane Florence and the dangers it poses to portions of the southeastern and mid-Atlantic United States. Hurricane Helene: Helene brought tropical storm conditions to the Southern Cabo Verde Islands and it's now moving away and is expected to turn north into the open Atlantic later this week and will not affect anymore land. Helene will likely become the second major hurricane of the 2018 Atlantic Hurricane Season. Tropical Storm Issac: Isaac has not become better organized and was downgraded to a tropical storm. Isaac is a small system and tropical storm force winds extend out up to 45 miles from the center. Isaac is forecasted to continue moving to the west towards the Lesser Antilles. Isaac is also forecasted to strengthen a little further (back to hurricane status) during the next 24 hours while wind shear is low, but after 24 hours, increasing wind shear should limit any further intensification. The intensity forecast has lower confidence than normal. Based on all the latest data, Isaac should be at or near hurricane strength as it passes through the central or northern Lesser Antilles on Thursday. Once the hurricane reaches the central Caribbean Sea it should weaken and possibly dissipate due to unfavorable upper level conditions. Interests in the Lesser Antilles should monitor all future forecasts of this system closely. Below you will see our latest 5 Day Alert Levels & Impact chance map for Isaac. Major Hurricane Florence: Florence rapidly intensified back to a major hurricane and winds are near 140 mph which makes Florence a category 4 hurricane. Florence has turned and is now moving west-northwest. The hurricane will be in a very favorable environment up until landfall. The NHC does forecast Florence to strengthen and winds should peak around 150 mph. The hurricane is being steered by a strong upper level ridge of high pressure located to its north. This will force the hurricane west-northwest towards the coast and a landfall is expected somewhere within the NHC’s cone along the SC/NC coastlines Thursday afternoon. Once the system moves inland, all indications are that it will likely stall or move very slowly which would bring major inland flooding to portions of SC/NC/VA into the weekend. Those of you in or near the cone should be beginning to execute your hurricane plan and as always listen to the advice of your local officials. Unfortunately, Florence will be a catastrophic hurricane as there will be multiple threats including major wind damage, catastrophic storm surge, and dangerous flash flooding. Hurricane & Storm Surge watches are in effect. Please review our 5 Day Alert Levels and Impact chances below for more information on the risk areas. Invest 95L: Last but not least, and area of disturbed weather associated with a surface trough in the Western Caribbean Sea has been showing some signs of organization. Currently, this system has a 70% chance of development during the next five days as it moves into the southern Gulf of Mexico. 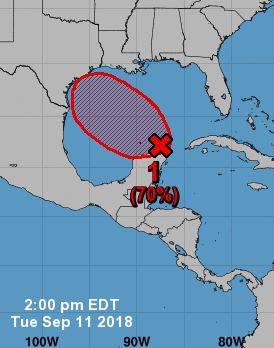 Some of the modeling data does indicate this could become a depression or a minimal tropical storm once in the western Gulf of Mexico and could potentially move inland along the Texas coastline later this week. Thank you for using the Hurricane Tracker App and we will have an updated discussion as the forecast warrants.